Since January, notable Canadians living here and abroad have come together as one voice to promote Canada 150 celebrations. In addition to their success, many of these people have something else in common: bilingualism! We asked them what it means to them and how speaking both of our official languages has enriched their lives. If you enjoy the winter Olympic Games, surely you know speed skater Catriona Le May Doan. Who could forget the 3-time Olympic medalist and world record holder! Catriona entered the French school system in kindergarten. “I saw the benefit early on of being able to communicate no matter where I was in our country, and many places around the world,” she said. For her, being bilingual means having the freedom to go anywhere! She still considers bilingualism to be an asset to her today: “Since retirement, I continue to use both languages for interviews, hosting events, broadcasting and volunteering.” She has enrolled both of her children in French immersion, because she wants them to have the same advantages she had. Yann Martel knows a thing or two about linguistic plurality. Born in Salamanca, Spain, he’s lived in Alaska, Costa Rica, Portugal, Mexico, France and Canada. You’ve likely heard of his novel-turned-movie Life of Pi, an allegory about the adventures of a shipwrecked boy from India. Ontario-born author and singer-songwriter Jill Barber has won several awards. An Anglophone, in 2013, she debuted her first French album, a selection of classic songs from Quebec and France. Poetry, theatre, movies and painting … culturally and artistically, Herménégilde Chiasson has done it all! An active creator since the 1970s, he puts a lot of emphasis on identity and social concerns in his work. His home province of New Brunswick appointed him lieutenant-governor from 2003 to 2009. Paul Davis is a young fashion designer who created his own menswear label. After studying fashion design, he moved to Paris to continue his training and start his career in the industry. After that, he opened his own boutique in Berlin. Now we want to hear from you! 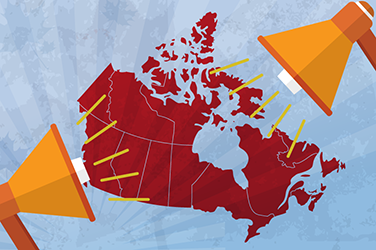 How has speaking both of Canada’s official languages benefited you personally and professionally? Tell us how being bilingual or multilingual has enriched your life! Il n’y a aucun billet de blogue connexe pour l’instant. I love languages. I think I always have. Being from Argentina, Spanish is my mother tongue. Then I started learning English as a teen. Many years later, I came to Canada to pursue graduate studies in translation and that's when I started learning French seriously. Later on, I met a Brazilian, and Portuguese entered the picture. I'm very lucky to live and work in four languages everyday: I work as a terminologist enriching TERMIUM®, and at home, I will only speak in Spanish, while my husband only speaks in Portuguese. This is how we speak to each other, in a different language, it's sort of crazy and fun. We're raising our children like that and it's turning out well: they can communicate with us and extended family in our own languages, they learnt English at their daycare and now spend most of their days in a public French school. We are language "chameleons" since we're able to change "colours" and fully participate in different situations and interact with diverse groups. I truly appreciate living in Canada and having that chance. I have a skill for languages, and my life is definitely richer because of it. I speak English, French and Italian, so that means I have a wide circle of friends and acquaintances from each language group, not just in the city that I live in, but around the world. I’m forever changing the language keyboard on my iphone so that I can communicate in the right language on Facebook, in Messenger or in a text message. I’m not complaining. It’s a small price to pay for being part of such a rich linguistic social group. Of course, this is just one example of how being multilingual has enriched my personal life. Professionally, I have gained a lot, too. Every day, whether I’m at work, at home or elsewhere, I’m reminded of how lucky I am to speak more than one language.